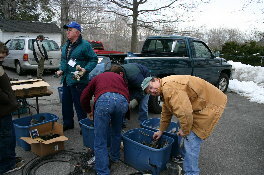 The Yankee Chapter's first meet of 2011 was Ron & Lois M's meet at Edwards Church in Framingham MA. We have come to expect this to be a cold one and temperatures were in the teens. However strong sunshine and little wind made it better than the thermometer would suggest. 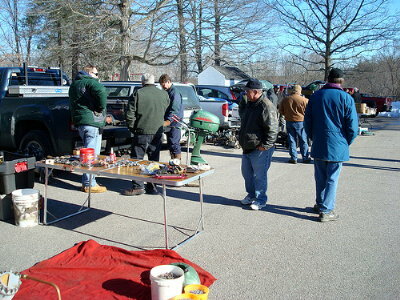 Plenty of motors changed hands, not as many parts (too hard to look through in the cold!) The church hall offered a nice place to warm up that was very welcome. 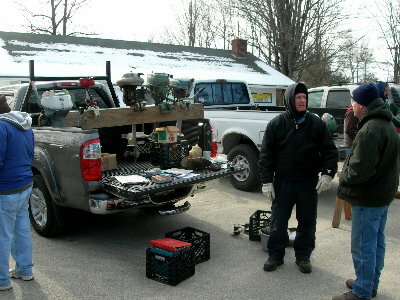 A meeting was held at lunchtime to review the upcoming 2011 Yankee Chapter Meets through the spring. Also discussed at the meeting was an important item that should be on everyone's radar regarding the summer wet meets. Due to budget short-falls in most New England states, there have been reports that marine patrols will be cracking down this coming summer and issuing big fines. To help avoid problems, all AOMCI members need to be sure their boats are legally registered, insured and have all safety equipment as required. Also that everyone complies with local requirements for navigation, horsepower, speed and noise. Certainly nobody wants to deter members from using their boats and having fun, however, getting an infraction that could be several hundred dollars is nobody's idea of a good time! Members are encouraged to review their states requirements and get everything in order for when the water softens in the spring. Thanks to Ron M. and Tom C. who contributed the photos below! Joe R. and Larry C. doing their "Michelin Man" impressions!! This Feathercraft is just waiting for the snow to melt and the rivers to soften! The did LeJay offer a snowblower attachment?!! Lenny R. offered dial indicators for every occasion. Frank P. and Lenny R. huddle together to stay warm. 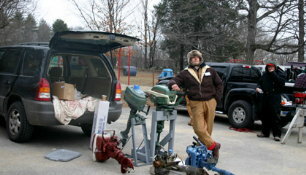 Ken H. tries to interest a couple of members in a Johnson HD-25. He gets a "frosty" reception..
Tom C. says "It ain 't bad in the sun"
Phil T. (center) says "guys, my hands are so frozen I can't button my shirt.."
What's all this talk about global warming? Walt L. joins in the conversation with (clockwise from Walt) Lois M., Barb S., Debbie C. and wife Maureen. I can only guess the discussion; probably the pros and cons of Bendix magnetos - that's a hot topic! Joe R. says he's finally getting some feeling back in his toes! People taking some time inside the hall to warm up. Lois M. sharing the joy with Barb S. over not having to make lunch for everyone! Phil T., Will G., and Ray S. - three Connecticut Yankees warming up. A few members enjoying a cup of hot coffee! C) Joe pitching the Knuckle Knews and Larry supporting his efforts as Editor in Chief! All kidding aside, thanks once again to Ron & Lois M. for hosting the meet - something all of us look forward to every year. When Ron & Lois first started having this meet, Jim M brought them a cake to say THANKS! It's become a tradition - here's the one for 2011! The answer to the multiple choice question in the photo above is "C" - The Knuckle Knews!! !